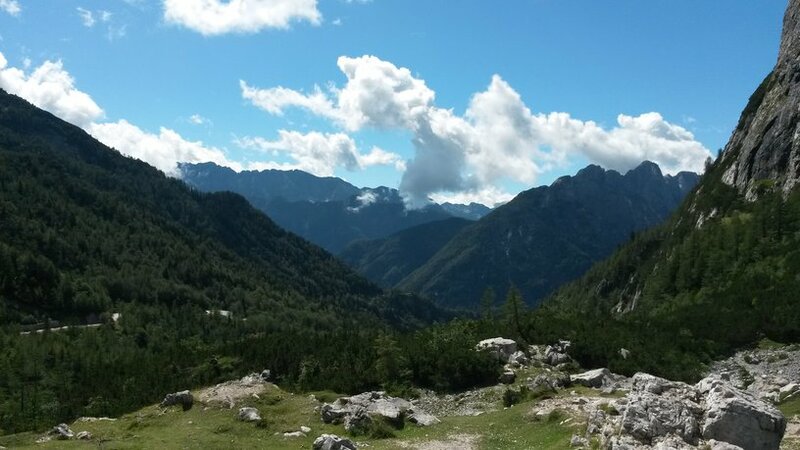 It was an unusually brisk, overcast morning in August when we began our 2 hour drive north-west from Ljubljana towards the Julian Alps. Like most highway driving on a cloudy day, there wasn’t much to scream about. The odd comment about a small town, church, silo, factory complex or other Eastern European-style grey building was as rousing as it got. Thankfully, our guide, Ivana, was delightfully passionate about everything we passed, despite no doubt travelling that particular stretch of bitumen thousands of times. Another fun activity was shuffling through the various Slovenian radio stations, trying to find the most captivating and excitable ad with the most thumping sound effects. Think of Dolby’s surround sound trademark… sound, and multiply by at least 100 with more umphs, w00ts and drawn out pew pews. “Ivana, what’s that ad for?” “Dishwashing liquid”. Wow. What a morning. Vršič Pass. Author: Alex Zych. About an hour in, the clouds and fog lifted and the traffic thinned out. The sun in all its glory beamed down on so much greenery. Green rolling hills, green pastures, green forests. Our first stop was Lake Jasna, where the legendary Greatest Of All Time Zlatorog has a statue. The lake itself was crystal clear, reflecting the sky, clouds, surrounding mountains and nearby alpine dwellings, making it quite the memorable first stop. Next we passed yet another chapel on the way up to a mountain pass in the Julian Alps proper. This particular pass connects two valleys, making for stunning views, which we inadvertently enjoyed for longer than expected due to some sheep crossing the road and thus blocking the pass for a little while. 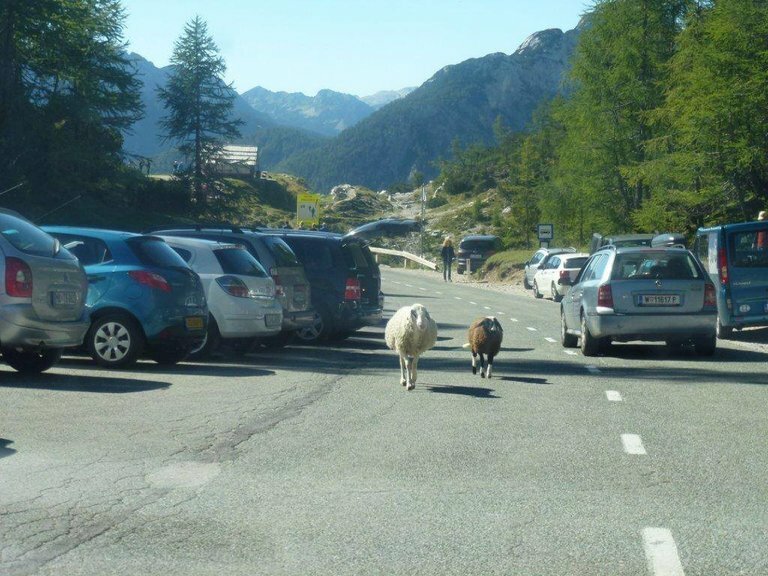 Sheep on Vršič Pass. Author: Gregor Födransperg. Soča river - small troughs. Author: Alex Zych. 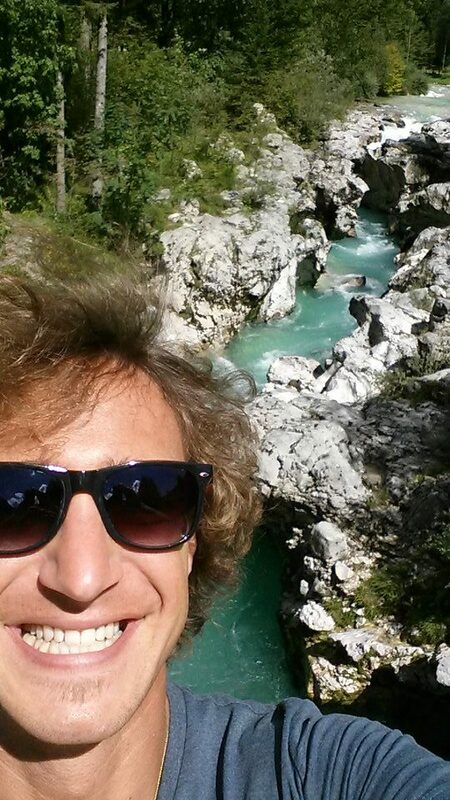 Another half an hour of scenic valley driving transpired when we reached a small footbridge over Soča river. It was a small gorge, with sharp limestone edges and crystal clear, blue Alpine rushing water. The sky and white limestone banks merely added to the green forest backdrop was something out of a fairy tale. Even more amazing is that something so pristine is found in the heart of Europe, not very far from anywhere. 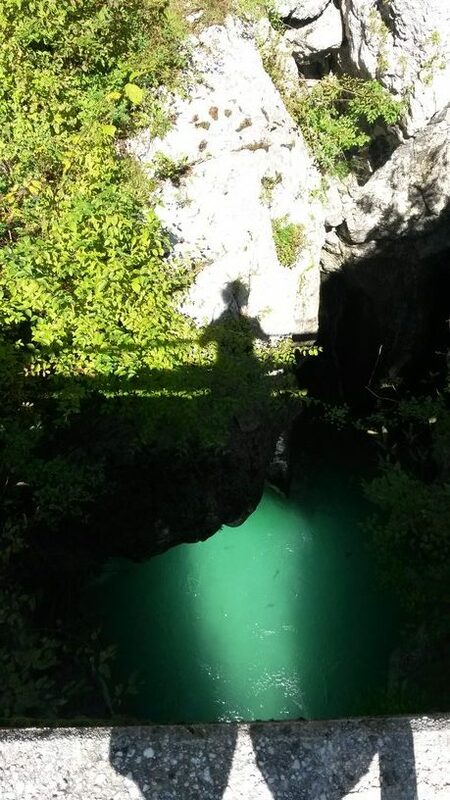 The view of Soča river from a bridge. Author: Alex Zych. At around lunchtime, we arrived at our destination. We met our guide, signed along the dotted lines, were matched up to appropriately sized gear and began our hike up along the sides of Sušec stream, first passing a lovely 10 metre waterfall. Our harnesses were put to use early as we slowly traversed the rocky and often wet banks, thwarting any risk of slipping and causing unwanted bruising or worse. All the while, we were gaining elevation and could always hear the gentle hiss of the stream below. Our guide was not only a professional abseiler, rock climber, canyoning-er etc., he was also a local, having grown up sans OH&S and as a kid, this was his backyard. Another 45 minutes or so later we stopped. The stream had turned into a small creek, and it was no way near as spritely as it had been for the last hour. We donned our wetsuits in their entirety, strapped our helmets to our heads, GoPros to our helmets and lined up. 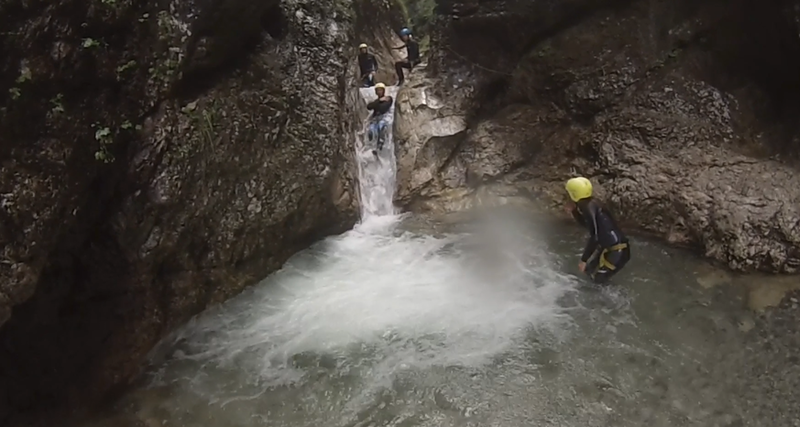 After a safety briefing, our guide strutted into the cold stream and ordered us to follow. He then pointed at a smooth rock, insinuated to sit on said smooth rock, cross our arms and touch our shoulders, and said “slide”. The initial reaction to an unpleasantly cold and wet posterior was quickly forgotten as we slid into a metre deep rock pool, submerging almost up to our necks. “Alvays bend knee” our guide coached as he bent over slightly and tapped both knee caps, “othervize break leg”. We waded through the stream, and continued slithering on our butts, each serpentine a little longer and rock pool a little deeper. Our first 2 metre waterfall splashed into over 3 metre deep pool. Fresh. Then we gently slid into a much bigger pool, after which we paused as our guide pointed to the over 3 metre high rocks surrounding and advised “you can jump”. So we did. Many times. We continued sliding down the stream until we stopped at a section where the water fell into a gaping hole in the rocks, around 3 metres down, and didn't splash down for another metre or so. From that high up, there was no way a human body would fit. Plus it was dark. And we couldn't see where the stream continued. Our guide simply said “swim to the right, othervize you hit head”, and disappeared into the crevasse. Thumbs up from below, and off we went one by one, each one of us letting out a sometimes not very subtle shriek. The current was indeed strong and was pulling left. One push right and we were gently floating along again. A bit of rock climbing, more jumping, more sliding. And then the grand finale – that burly waterfall from the beginning of the expedition. We were almost already back at the bottom of the stream. Our guide solidly plonked himself atop, ushered us to follow him, pointed at our harnesses, his ropes, and down into the pool at the bottom of the 10 metres. He got us this far, what the heck, right? He lowered us around 1 metre, gestured to push off against the rock, and let go. Everyone shrieked, or screamed, and if they didn’t, it was because it was all too quick. Time flies when you’re having fun – we’d been in that canyon for 3 hours. Tagged adrenaline, daytrip, Gorenjska region, off the beaten track, Posočje region, river, Triglav National park. Bookmark the permalink.